A short match, but perfect for the time it got. Basically thy put over Briggs' strength, had Garrini keep trying to choke hit out with the guillotine, then had him Briggs counter it into his finisher for the win. POST-MATCH SEGMENT - Good. Stokely Hathaway offers Josh Briggs a Catchpoint contract. Stokely, honest man that he is, told Briggs that "There is some fine print, but you don't have to worry about reading it. It's called "fine print" for a reason, and that's because everything printed in it is fine." I love Stokely Hathaway so much! Briggs took the contract, but also gave Stokely a very "get out of my way" shove and headed to the back, contract still in hand. Stokely was in a celebratory mood because, while Briggs didn't agree to anything, as Lenny Leonard noted, "he didn't say 'no,'" either. Just as Alanis, A.R. Fox, and the rest of the Skulk were making their entrance, the fire alarm went off. The crowd chanted "BURN IT DOWN!" while Lenny Leonard went in a much more tasteful direction by simply cracking a joke about the Skulk having new entrance music. Neither of these compare to the crowd at TNA Hard Justice 2006, which reacted to an actual fire in the rafters of the Impact Zone by chanting "THE ROOF! THE ROOF! THE ROOF IS ON FIRE!" and to the arena filling with smoke by chanting "YOU CAN'T SEE US!" To get heat (as if he needed it, dressed in a Yankees hat and with a Yankees logo on his gear here in Boston), Kng claimed to have been the one to pull the fire alarm. Neither of these got heat with me sitting on my couch at home, as I am a Yankees fan and I didn't have to listen to the fire alarm for however long it was trilling, but he already had heat with me for apparently thinking he doesn't need vowels in his name. 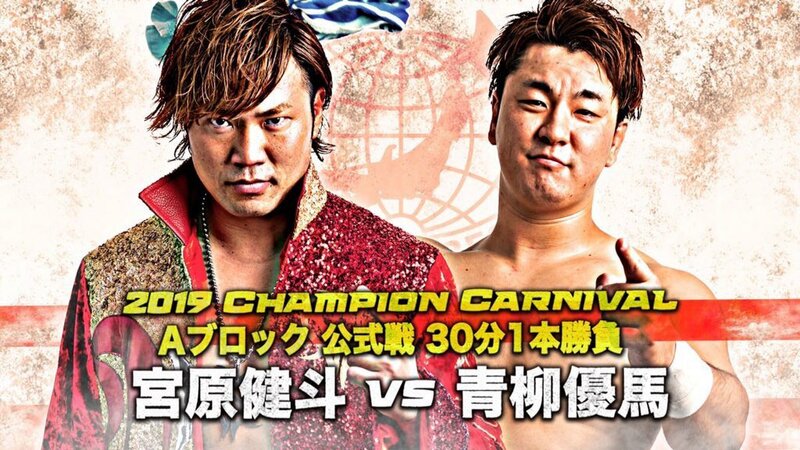 This was another relatively short match that was fine for the time it got, but nothing that really left me impressed with or invested in either of these two wrestlers. Alanis got the win, then Fox cut a promo building up his Evolve World Title match with Matt Riddle later tonight. The Skulk all chanted "NEW CHAMP!" and argued with some fans who were chanting "BRO!" for Riddle. 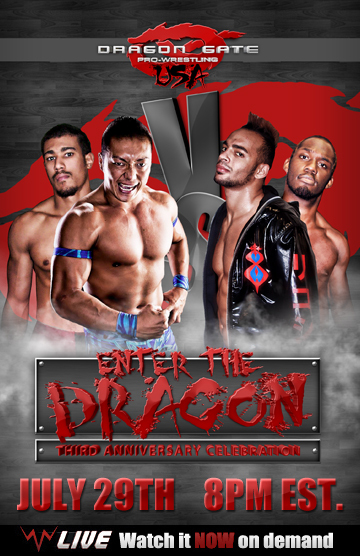 They dropped the "his lovely assistant" part of "his lovely assistant Candy Cartwright" on Jarek's entrance graphic. Darby started off strong but Jarek cut him off... and then the fire alarm went off again. They just wrestled through it, although the fans demanded that Jarek "USE YOUR MAGIC!" to shut it off. When it finally did turn off (after Jarek kicked out of a pin) the fans chanted "THANK YOU, JAREK!" Later, when Darby got his foot on the ropes after taking a sit-out Dominator from the top rope, Candy argued to the referee that Darby's feet were no, in fact, on the ropes, and that it was just "an illusion." I f*cking love these two so much. The match told something of an interesting story, with Darby being the underdog babyface out for revenge, but also building up the idea that going to the top rope never worked out well for the guy who went up, until the finish where Darby finally managed to hit something off the top, did it again, and then got the pin. Jarek's continual losing is getting baffling to me at this point. He has to get SOMETHING to prove his worth, doesn't he? Henry charged at Thatcher to start things off very hot. This was a vicious charge that did an excellent job at setting the tone for the rest of this match. This was two guys with something of a beef just knocking the crap out of each other and trying to rip each other's limbs off, all while always retaining an air of professional sport to it. Henry worked the knee while Thatcher worked the arm, and they seemed willing to grit through any amount of pain to not give in to the other. This match, quite simply, was mean. Henry picked up the biggest singles win of his EVOLVE career, which felt like a real step forward for him. POST-MATCH SEGMENT - Good. WALTER came out to check on Thatcher. Henry offered Thatcher a handshake, at which point WALTER nearly knocked him out with a vicious, unprovoked blindsiding big boot, continuing his poor sportsmanship from last night. Thatcher continued his as well by laughing at this. FIP Rules just means that anything goes. This was supposed to be just Theory vs. DJ Z but Theory cut a pre-match promo insisting that Janela's victory over him for the WWN Championship last night was a fluke, and that unlike him, Janela had no future in the wrestling business. He then said that as long as he is the FIP World Heavyweight Champion, he would still be the face of the WWN. Janela came out and challenged Theory to prove that the loss was a fluke by letting him into this match as well, and both DJ Z and Theory agreed, with Theory referring to Janela as "indy trash." They had a great "action-packed three-way" type of match, with all three guys looking quite impressive. The finish saw Janela hit DJ Z with an avalanche brainbuster but Theory ran in and rolled him up for the pin, keeping their issue alive. In fact, with the position they wound up in on the pin, you could probably even argue that Janela was pinning DJ Z the whole time (and even before) he himself was rolled up and therefore Janela has a claim to the title as well. It's obviously spurious, but I wouldn't put it past Janela to try to use such a claim. A solid showcase match for all four men, with Al Sabah picking up the surprising victory (pinning Jaka no less) in his EVOLVE debut. Williams looks... different. I don't know if he died his hair darker or just got a haircut or what, but he looks kinds of different, like I could understand how someone might think it's not the same guy. Apparently there is a difference between Catchpoint Rules and Pure Rules, which is that Catchpoint Rules don't let you get off with a warning after your first closed fist to the face. We learned this when Tracy immediately punched Dickinson in the face... and then turned to the referee for clarification on whether this was okay or not. I laughed. Williams then proceeded to wait for Dickinson to get up before punching him in the face again. And again. And then he just pounced on him and starting raining down the blows, purposely getting himself DQed. Stokely came in to check on Dickinson, at which point Tracy got a hold of him but Garrini game out, foricing Tracy to deal with him. Tracy did, and they repeated the process with Jaka. Tracy then got his hands on Stokely again but Dickinson recovered and saved Stokely. Catchpoint held Williams down so Stokely could get some punches in. Then they picked him up but still restrained... at which point Josh Briggs came out. Catchpoint assumed he was joining them, but instead he attacked them and saved Tracy. 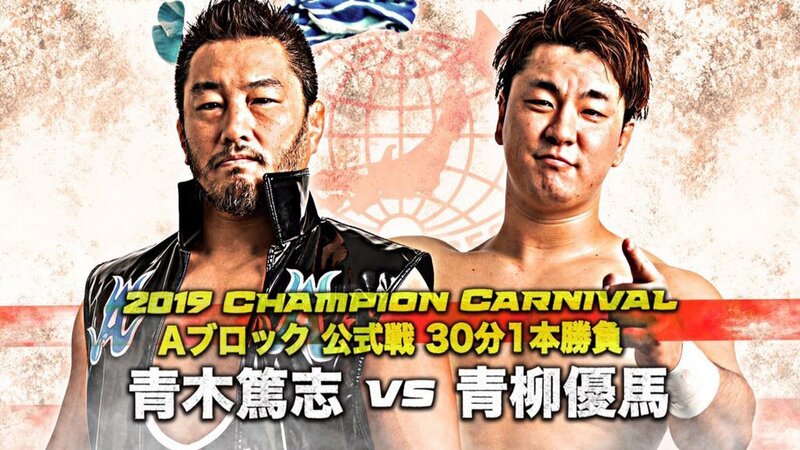 He tore the Catchpoint contract up and shook hands with Tracy, who then demanded a match against Catchpoint at the next show in this market, which will be Evolve 109 on August 5th, saying he doesn't care if he has to fight one of them or all of them. 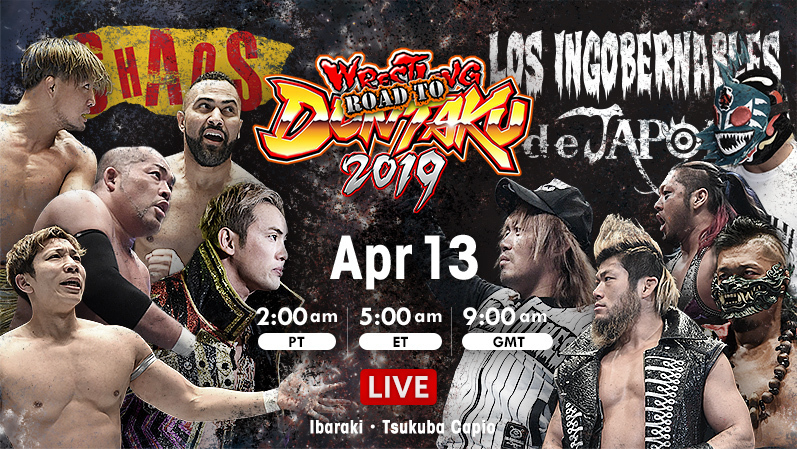 As an angle, this was fine... but I was quite disappointed by it because this was probably the match on this show I was most looking forward to (either this one or Jarek vs. Darby). I know this sort of thing is key to episodic storytelling, but I'm feeling that it is happening a bit too often for my tastes, and especially for my expectations of these things from EVOLVE. 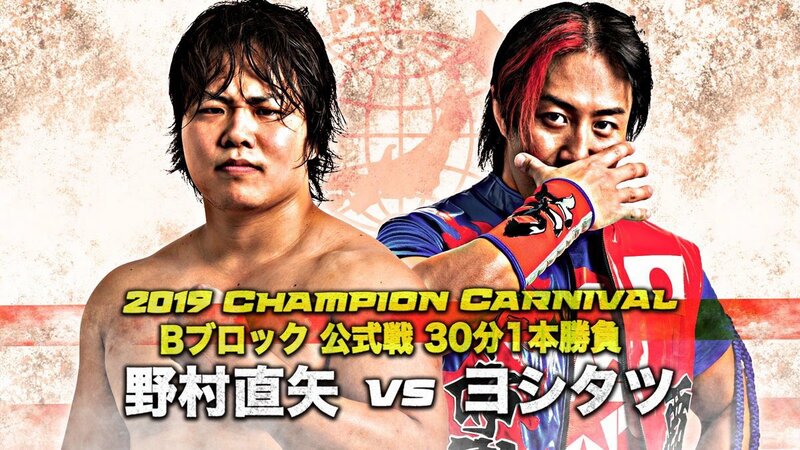 Fox is wrestling barefoot to... um... mock Riddle, maybe? It seems like a big disadvantage for someone who likes to use the ropes as a springboard as much as Fox does. They had a mediocre match for a while, then all of a sudden they did one crazy sequence of reversals and kicked it into high gear for the rest of the match. This was like a 4.5 for the first half of the match or so, then 9 for the second half. Seeing the Skulk prematurely celebrating whenever Fox went for the cover after a big move only for Riddle to kick out at the last moment was funny, and they had me convinced that the title was going to change hands several different times. Even after Riddle became the first person to even kick out of the Foxcatcher (in EVOLVE, at least), Fox still seemed like he was going to leave with the belt. Riddle made a great comeback and got the win off of some vicious strikes for a referee stoppage. POST-MATCH SEGMENT - Good. FIP World Heavyweight Champion Austin Theory assaulted Riddle after the match, telling him "I'm the best champion around here." A.R. Fox then confronted Theory so Priscilla Kelly shoved him, then she and Theory ran away from when Ayla and the Skulk got into the ring, which Ayla having to be restrained from going after the retreating Kelly. Riddle then cut a promo showing Fox respect and telling him he could have a title shot whenever he wanted one. The Skulk responded to this with their own weird way of showing Riddle respect, which was to dress him in their weird paraphernalia and dance around him. 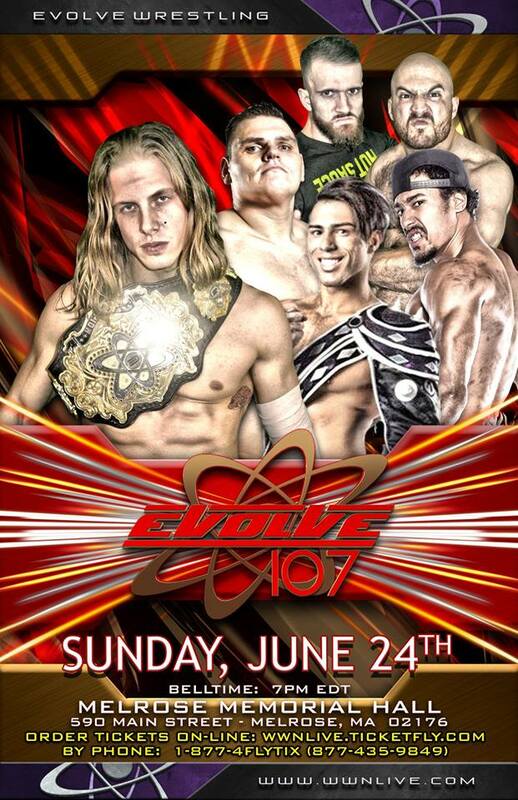 They left, and Riddle challenged Theory to a match when EVOLVE returns to Melrose in August. This was a very up-and-down show from EVOLVE. There was a clear divide between things that were mostly intended to be storyline segments and things that were mostly intended to be great wrestling matches, but a lot of matches I was excited for either fell on the storyline side of the line or (like Jarek vs. Darby) didn't deliver quite like I had hoped. Gabe is doing a very good job at establishing some new status quos certain characters and units, but seems to be missing the boat with some others (Jarek losing, Kincaid not going anywhere, Davis' random return [though I'd love to see Davis and Bad Bones form a random tag team of hard-hitting power guys]). Gabe has an amazing track record so I have faith in him, but there were definitely some decisions made this weekend that have shaken that faith a bit.